If there is one thing golfers remember – even when their round is in tatters – it’s the vistas! And that’s enough to suggest golfers may come from all around the world to play two courses on Tasmania’s King Island when they are completed and open for play. Indeed renowned course architect Graeme Grant contends the island’s two new courses, Ocean Dunes and Cape Wickham will turn King Island, off the north-western tip of the main island of Tasmania, about half way between Tasmania and Victoria, into something of a golf mecca. While this might sound like ‘pie in the sky’ stuff, at this early stage, Grant suggests King Island could one day find itself being compared with the storied Monterey Peninsula on the US west coast where courses like Pebble Beach and Cypress Point have been rated among the world’s great golf destinations. 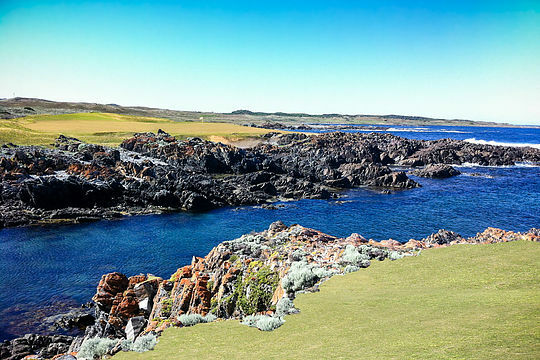 Grant is the brains behind the Ocean Dunes design…a soon-to-be-opened 6,365m par-72 links on King Island. “I think we’ve got two world-class golf courses here but I do realise this has to be confirmed by the players who will hopefully spread the word over the next two or three years,” said Grant. The Southern Ocean acts as a breathtaking backdrop on the downhill approach to the par-five opening hole. At the short par-four second, the ocean skirts the right hand side of the hole and must be driven over at the long par-four third, while Ocean Dunes’ 130m par-three fourth promises to be one of the most photographed holes in Australian golf with an ocean carry to a green perched out on a rocky point. Already 12 holes have been completed at Ocean Dunes with the completed layout expected to be open for play in February 2016.